I remember when I began to question the silence around me. As a little girl, I was naive about Alzheimer's disease and thought nothing was wrong with my grandmother. She forgot a few things here and there, but I never put the pieces together. However, when my grandmother could not even recall my name, I knew something was radically wrong. i was forced to learn about Alzheimer's on my own because my father was having a hard time grappling with the disease. I wanted to understand what was gradually taking the life out of my grandmother, stage by stage, day by day. For the past 10 years, I have witnessed my grandmother's memory fading into a state of eternal blankness. Yet, I refuse to let Alzheimer's rob me of my memories of my grandmother, the loud and dramatic woman who shined on stage and was always ready for her next callback. Despite the world's growing knowledge of the disease, many people are unable to face their loved ones' Alzheimer's diagnosis. Watching family members repress their internal pain and seeing soon-to-be-helpless victims crumble inside only motivates me to extend my support toward this intrepid and growing community. The idealistic side of me believes that my generation will finally find a cure for Alzheimer's. 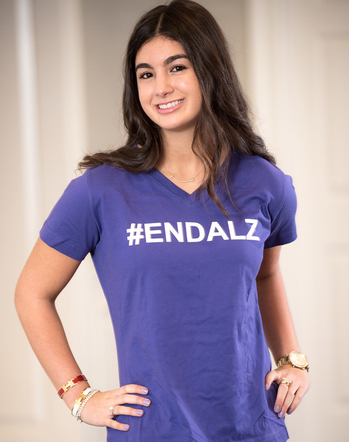 This is a goal I know I can't tackle alone, so I strive to raise awareness about Alzheimer's. My voice speaks for more than just myself; it amplifies the struggling of the millions of people suffering today. For the past five years, I have participated in the Walk to End Alzheimer's as the team captain of the Rye Country Day School team. I also founded the Alzheimer's Awareness Club at my school and attended the Advocacy Forum on Capitol Hill this past spring. As a 17-year-old girl, I was leaving the purple piece of my heart on the podium, helping advocate for future legislation to support the care and research related to Alzheimer's disease.